Intel just about perfected the small form factor (SFF) home theater PC (HTPC) over the last few iterations of NUC systems, so it is great to see that the Skylake based Intel NUC6i5SYK kit has stayed with this winning formula. Updated with an Intel Core i5-6260U with Intel Iris Graphics 540, support for NVMe SSD, and DDR4, the system has the opportunity to fix the shortcomings in the previous generation (cough, CSH). The sleek looks and features will not be as much of a bargain as the plug-in-and-go Intel Pentium based NUC5PGYH. Intel is asking $380/£335 for the barebones kit, but with quite a bit more performance, better networking, and features on tap, it could well be worth the extra dosh. Gone are the days of the Intel Chime, but it was not missed this time around. The packaging is not quite as end-user friendly as the NUC5PGYH, but given that it requires buyers to BYO RAM + storage + OS, that should be just fine. It is all spelled out clearly on one of the sides. I must say, again, how much I love the power supply that Intel ships with the NUC systems. It is brilliant. One box, works everywhere in the world – awesome. Instructions and a VESA mounting plate are also included. The plastic top of the Intel NUC6i5SYK is removable, supporting third-party add-ons via the internal USB and power headers (if necessary). The chassis itself is formed from high quality brushed aluminum and a steel bottom. It not only looks the part of a polished HTPC, but the lights are perfectly muted for theater use. As a nice touch, power status is now indicated on the front panel (instead of the top), so it is much easier to see from the couch. It is also worth mentioning that Intel opted for a full size HDMI (Huzzah!) port, so you will not need to include a mini-HDMI adapter in the kit list. Disassembly is required to install the RAM and SSD, with the four screws that hold it all together found in the rubber feet. For a PC of this size, there is a significant amount of expansion available – either via the USB headers or the standard SATA3 header. If there is any chance that you will add storage, probably best to grab the Intel NUC6i5SYH instead (the “H” is for hard drive :)), but if you do decide to expand the NUC6i5SYK later a SATA power cable is available from GORITE – as well as several lid expansion options. Just remember that only 5V storage devices will work. Removing the motherboard from the case was much easier than previous models, but only required if you want to make use of top-mounted components or accessing one of the more exciting features of the system. After last year’s disappointment, I was pleasantly surprised to find a proper standalone header for HDMI CEC on the underside of the board. No more soldering, no more sourcing voltage from random pins/headers. You just plug it in here and to one of the open USB headers, and it just works. There is even a convenient location to tape the Pulse-Eight adapter. The install was covered in a bit more detail before, so we can skip it here. The Intel NUC6i5SYK’s BIOS should look familiar to anyone with experience with modern Intel systems. It has a bit more polish than previous generations. BIOS updates actually work straight from the menus this time, but there is a key feature that has gone missing – again! I cannot stress enough how fantastic it is that Intel includes consumer infrared (CIR) on the NUC systems, but one of the things that makes it worth paying more for an Intel Core NUC (vs the Atom model) is that they support discrete IR power commands. However, with each new model, the feature goes missing! Enthusiasts who rely on this capability to enable power on/off macros have to cross their fingers and hope that it will make it back in at some point. I have escalated this with Intel and from what I have been told a potential fix could be delivered shortly. While it is less than ideal that it happened, again, it is fantastic how responsive Intel has been around the issue. Support for high bitrate (HBR) audio bit streaming (Dolby TrueHD, DTS-MA) on Microsoft Windows is another reason to select an Intel Core NUC., otherwise because the video features: including hardware accelerated (HWA) codecs, video processing, 4K (HDMI 1.4b @24Hz), and 3D support are very similar between this and Pentium NUCs, the media consumption experience is very similar as long as you rely strictly on hardware decoding and rendering. 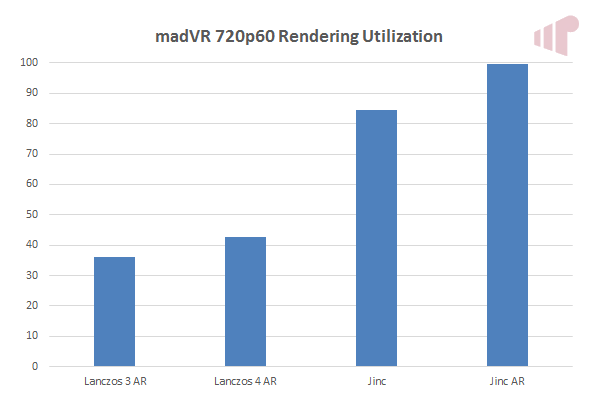 Although, with much greater memory bandwidth and the more capable GPU/CPU combo, the incredibly flexible GPU based renderer madVR is well within reach – something that will be explored in more detail later. 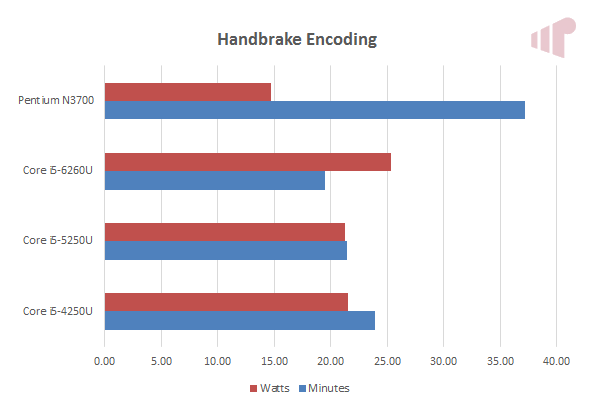 Handbrake is a great way to test multi-threaded CPU performance. Looking at the results, which highlight generational differences as well as providing insight into the performance delta between the two core Intel Core i5-6260U and four core Intel Pentium N3700 CPUs. Starting with the three Intel Core systems, we can see roughly a 10% improvement per-generation. Oddly, the power consumption is considerably higher (18.8%) between the Broadwell Intel Core i5-5250U and Intel Core i5-6260U. Naturally, the Intel Pentium system cleans up on power consumption, but at a 47.5% performance penalty compared to the Intel Core i5-6260U. 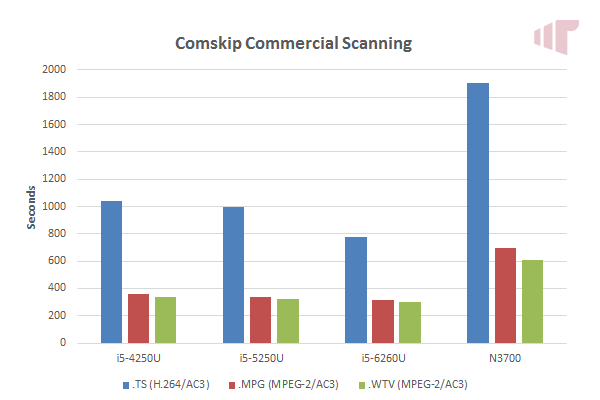 Turning towards the popular commercial scanning utility Comskip, which is mostly single-threaded, three TV recordings were scanned and the performance captured in the graph above. There was not much of a difference noted between the Intel Core systems for MPEG2 files, but when it came to the more complex H.264 format, the Intel Core i5-6260U has a 28.5%/33.8% advantage over the older CPUs. Some of this can be attributed to the higher base (1.8GHz v. 1.6GHz) and peak clocks (2.9GHz v. 2.6GHz), but it must also be able to run a single core at full speed for a longer period without throttling. 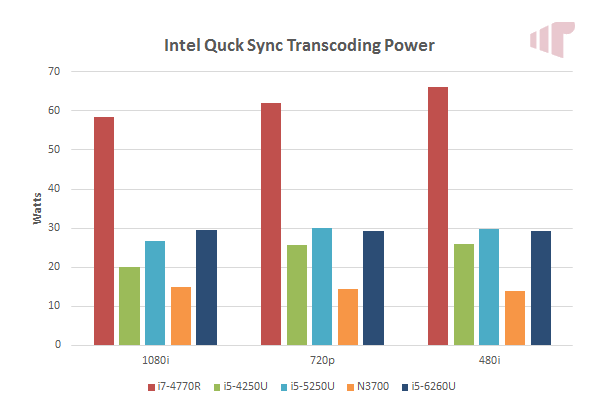 With each new generation Intel Quick Sync, the dedicated hardware transcoder ASIC gets better and better; most notably with 1920×1080 h.264 content. Here we can see an 80.6% improvement versus the Intel Core i5-5250U. And quite interestingly, 18.5% compared to the quad core Iris Pro equipped Intel Core i7-4770R. 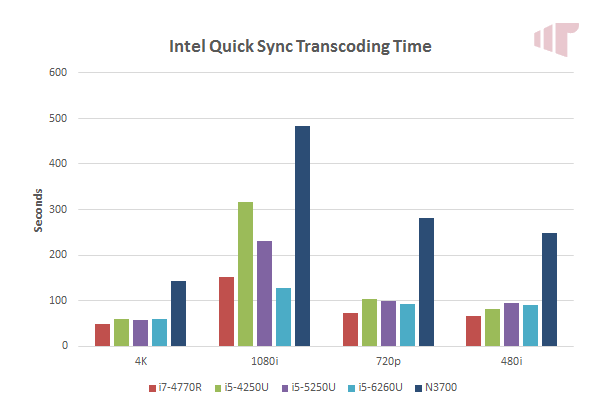 Power consumption during Intel Quick Sync transcoding remains relatively flat, with the massive performance improvement for 1080i h.264 only requiring 2.7W more than the Intel Core i5-5250U. 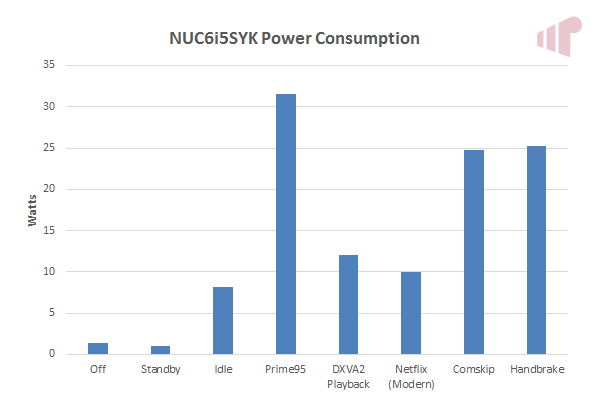 In general, power consumption was very good for the Intel NUC6i5SYK. Interestingly, this is the first system I have tested with higher consumption when off (1.4W) than in standby (1W). 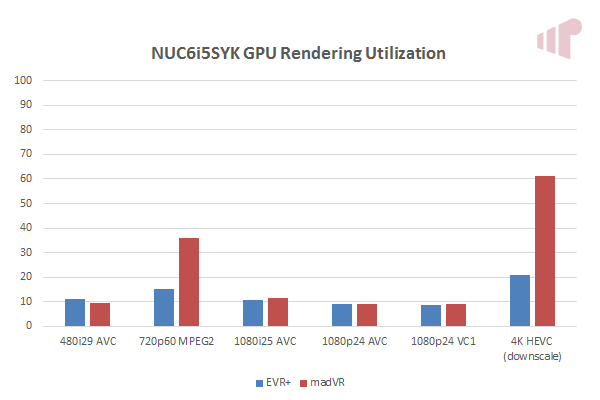 GPU video performance was tested using a pure hardware path (EVR+) and the alternate, shader based, madVR renders. Intel’s video post processing (VPP) is generally quite good so there is not a huge need for madVR on the platform. However, it provides algorithm flexibility that is not present from the hardware VPP/scaler; so you can choose a softer/sharper/whatever look, if you prefer. For content types under 4K, Lanczos with three taps and anti-ringing were enabled. Catmul-Rom, the default downscaling algorithm, was selected for 4K as the GPU was not up to using Lanczos for this purpose. To dig into the capabilities a bit more, the most demanding format (720p60) was selected for upscaling. During testing I noticed an interesting artifact that required renormalizing the numbers presented in this chart, and the previous one. Like most Intel integrated GPUs, the Intel Iris Graphics uses a dynamic frequency range, scaling between the minimum (300MHz) and maximum (950MHz) depending on load and TDP headroom. Because of this, the GPU load percentages are normalized to the maximum to present a single metric for utilization. While pushing the GPU, it never reached 950MHz, only hitting 900MHz briefly before throttling back to 850MHz. While the top end is technically 950MHz, the practical limit is more like 900MHz. Even that is a stretch if running for extended periods. For this reason, the percent utilization represented here is normalized to 900MHz, and not 950MHz, which provides a more accurate indication of the observed results. With that said, the Intel NUC6i5SYK is Jinc capable; which as far as I know makes it the first NUC able to handle its complexity. Jinc anti-ringing is still out of reach however, even with the normalized utilization anything more than ~90% equals frame drops. This throttling limitation likely plays out in the noise levels of the Intel NUC6i5SYK. It is barely audible at idle and not much louder under load. Unsurprisingly, levels are exactly what we have come to expect from Intel GPUs – spot on whether using PC (0-255) or video (16-235) samples. Nothing more to say. Refresh rate accuracy is also excellent regardless of the source. With upgrades to the storage subsystem, Wi-Fi, Ethernet, RAM, and CPU, refinements to the chassis, and the huge improvement in HDMI CEC expandability, the $380/£335 Intel NUC6i5SYK is a worthy update on an already fantastic platform. It builds on the home theater capability that we have come to expect from Intel HTPC; HBR audio bit streaming, good VPP, good video HWA codec support (which now includes 4K HEVC), and most importantly, stability. There is one ‘gotcha’ though, and it is especially frustrating because it happens every time. Discrete IR power controls have gone missing again. « Will you buy another AnyDVD HD license? I’ve been using three of the 1st generation i3 NUCs for all of the TVs in my house except for my main Home Theater display. The satellite TVs are mostly used for viewing live TV or streaming movies from my server, and the Intel NUC is more than up to the task. I run Windows 7 and Kodi on all of them. I’m on FIOS so I’m also able to share my recordings made on the primary HTPC with all of the NUCs. I love the fact that the latest generation NUCs have the ability to use standard 2.5″ SSDs. However, I would be hard pressed to use one of these as the centerpiece of a home theater system, even though they are probably more than capable. I prefer a larger PC that allows me to make internal upgrades. Of course, now that it appears that Ceton may no longer be selling their internal PCIe cablecard tuners it may not be so much of an issue anymore.